Foreign media outlets are giving thumbs up to the PyeongChang 2018 Olympic Winter Games as they slowly come to an end. They are spotlighting the organization of the Games, such as the application of cutting-edge IT, the excellent quality of the venues, overall safety and volunteer activities, as well as the message of peace that can be found everywhere at the international sporting event. 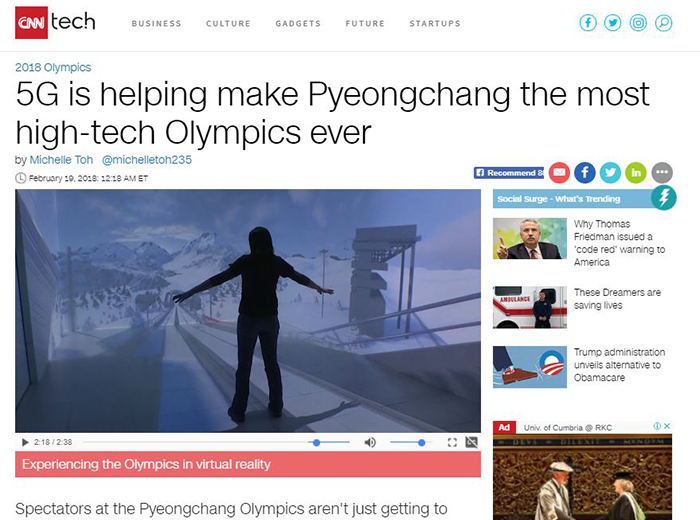 Many news outlets have also praised the general operations of the Games. Media outlets have also been impressed by the message of peace that the Olympics convey. The New York Times pointed out that the South and North Korean athletes from the joint ice hockey team carrying the torch together was one of the most stirring moments of the Games. It said that, “Doing so in South Korea -- and in Gangwon Province, where North Korea is visible from the peaks of the ski slopes -- the symbolism this time was particularly striking,” in its article titled “Olympics Open With Koreas Marching Together, Offering Hope for Peace” on Feb. 9.